Oregon wine has definitely piqued media members’ curiosity this past year. Articles mentioning Oregon wine soared from around 12,000 to almost 17,000 this past fiscal year, a jump of 37%. Similarly, articles mentioning Oregon Pinot noir went up 58%, and articles mentioning Oregon Chardonnay swelled 74%. This year has also been unique in that we have held three large comprehensive wine tastings. In June, we hosted Erin Brooks of The Wine Advocate, who reviewed 822 wines in her first Oregon Report, with more coming in Part 2 this fall. She also visited 20 wineries chosen by The Wine Advocate editorial team. 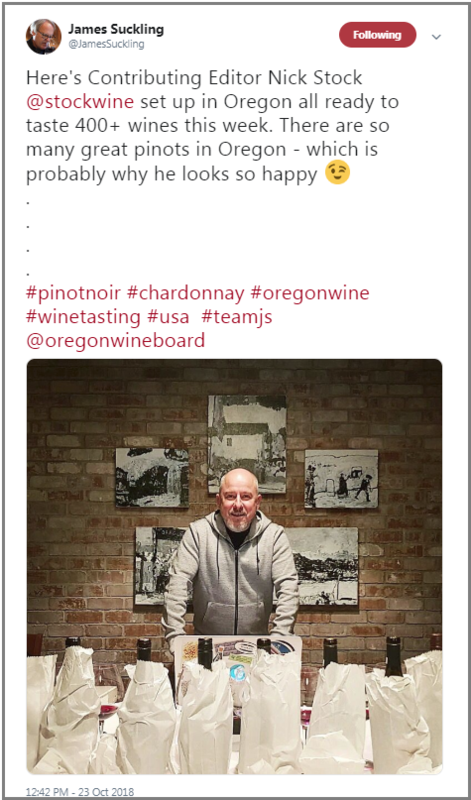 On a smaller scale, we hosted Albert Letizia in July, who, with Anthony Dias Blue, reviewed 90 Oregon Pinot noirs and published them in October’s Tasting Panel magazine. We also hosted two reviewers from James Suckling: Nick Stock from Melbourne and Raffaele Vecchione from Tuscany, who traveled here to taste through 400 Oregon wines in October. The reviews are due out in November; both men vow to return for IPNC. When OWB hosts reviewers, publications pay for the writers’ travel costs while we put the calls out for wines, organize, catalog and store them at cellar temperature, then arrange for their delivery to a tasting space. Even when a professional somm is deemed unnecessary for the writers, we insist on hiring somms to taste the wines to help make sure they’re showing well before going before the reviewer. The OWB provides food throughout the day paired with the tastings. We set up the tasting every morning in a quiet, comfortable, climate-controlled space where they can taste, blind or not. As well as a professional taster, we provide water and spit buckets and, for eight hours a day, put wines in front of them to taste. If wines exhibit TCA, we quickly swap in the second sample submitted. As you know, we have Bree Stock MW on staff and she also works hard to provide tasting help and context for journalists summing up our region. The most important amenities we can provide to these writers as they taste through 100+ wines per day are respect and comfort. The reviewers often possess highly sensitive noses and palates as well as particular tasting styles and preferences for glassware, water type and tasting temp. No food smells or loud noises or throngs of people can compete with their tasting. Sometimes we rent glassware, tablecloths and wine fridges to get the tasting environment picture-perfect. After tasting, the journalists are usually ready for a good meal and sometimes they’d like this to be with winemakers, and sometimes not, and we honor their requests. Once the tasting is done, OWB gathers up the wines submitted. The bottles are returned to the winery, repurposed for other media to taste and review, or sent with attending somms so they can recommend Oregon wines to diners. Some wines go with the journalist. When the reviews come out, weeks or sometimes months later, we hope our premium wines will speak for themselves. We all strive for 90+ scores, and many times half of our wines do achieve this. In the case of The Wine Advocate, OWB asked if wine could be resubmitted if scores were undesirable because 5% of the wines submitted were deemed by the reviewer to be flawed. With the Tasting Panel, 4% were flawed. And in the case of James Suckling, fewer than 1% were flawed. Taste your wines with a critical palate before submitting. Make sure what you’re sending represents your very best, not only for your winery but also for your AVA and the state as a whole. The reviewers are making judgments, and each wine speaks volumes about our region. It is better to submit only your very best wines than it is to submit too many wines. Put your tech sheets in the box with the wines so they accompany the wines from the cellar to the reviewers. If you’re listing your wines on one page, list them from entry level to highest quality. Know that journalists are doing their best to make good, informed judgments in a small amount of time. They are professionals in their field who are expected to treat the eight hundredth wine they taste and evaluate from Oregon the same as the first. Finally, know that the journalists pay their own way to Oregon and their editorial team chooses where they visit. Thank you so much for the opportunity and trust you place in OWB to provide journalists with premium wines and spectacular hospitality in our beautiful state. If you have questions, please feel free to contact me at sally@oregonwine.org. Score one for Oregon wineries. Finally, it is that time again when we look ahead to a new year and begin the process of renewing Oregon Winegrowers Association annual memberships. As you may be aware, OWA receives nothing whatsoever from the grape tonnage tax collected by the OLCC. The vital legislative and regulatory work essential to our growing industry is primarily financed by membership dues. If you are one of the hundreds of wine business owners who are not yet OWA members, we encourage you to thank those who are. Their investments in the OWA have delivered important benefits for business owners including lower federal wine excise taxes and accelerated depreciation, which lowers tax liabilities for growers who invest in new or replanted vineyards. In addition, the OWA achieved an exemption for all wineries from the requirement that they pay cellar and crush pad workers for both daily and weekly overtime hours. Wineries are again liable only for the greater of the two. And OWA also convinced administrators at the DEQ to waive winery wastewater permits, and the associated fees, for wineries on farmland producing fewer than 6,000 cases each year. Many wineries and vineyards can join the OWA for as little as $200 and earn savings on FedEx shipping as well as on tickets to the Oregon Wine Symposium coming up again in February. Click here to learn more about the OWA and join those who help advance our industry’s agenda. As many of you know, the Oregon wine community lost a dear friend when winemaker Jesus Guillen succumbed to a short battle with cancer earlier this month. To honor Jesus’s memory and help his family, Winter’s Hill Estate will be hosting a benefit on Nov. 24, pouring only Guillen Family Wines. Please refer tasters, stop by to show your support, or sign up to volunteer to help. You can also donate to a GoFundMe campaign to help Jesus’s family with his medical expenses. Get more information. With the majority of Oregon wineries producing fewer than 5,000 cases, the DTC channel plays a critical role in the success of many in our industry. That’s why the 2019 Symposium features a business track dedicated to DTC practices to help smaller wineries up their game in this space. Learn more about the DTC Business track. The Journal of Wine Economics recently published an article singling out TIWA, asserting that the competition’s evaluative methods are far more detailed and rigorous than is typical for other competitions. It’s just one of the reasons OWB encourages Oregon wineries to submit wines to this awards program (another is free shipping from OWB). Read more about this competition. Register now to join OWB in London next March for joint tastings with the Washington State Wine Commission. If you export to the U.K. or are seeking an importer, consider joining us. Register here. Oregon Wine Trail is going to Toronto. Join the OWB as we return to Toronto in April, where we will host an Oregon Wine Trail trade and consumer tasting as well as multiple master classes for the trade. Register here. Each year, the OWB hosts a group of international trade members in late June, chosen from among nominees provided by the industry. The group attends Oregon Pinot Camp and also meets with winemakers from around the state to get a complete picture of wine in Oregon. Learn more or make a nomination. Join one or all four of a series of webinars running Nov. 27-30 to learn how to use the Oregon Wine Profit Planner Workbooks to help you link your business decisions to your bottom line. Each workshop will cover one of the four Profit Planner Workbooks: Vineyard P&L and Cashflow; Winery Cost of Goods; Marketing, Sales & Portfolio Management; and Tasting Room Profitability. Learn more and register. OWB has prepared a package for wineries to use in presenting Oregon Wine Month 2019 to distributors in state and around the country. If you missed the webinar on Nov. 15, you can watch the recording to learn how to equip your distributors to make the most of Oregon Wine Month. The deadline to enroll distributors to participate in Oregon Wine Month 2019 is Feb. 1. Watch the webinar and learn more. Take advantage of your time in Portland for Symposium to extend your DTC education: OWB is sponsoring two WISE Academy workshops during Symposium week, offering them at $55 (normally $700). Tasting Room Management Training will take place Feb. 11, with DTC Metrics Intensive happening Feb. 14. See session descriptions and register. This fall, more than 1,500 tourism partners – including those from the wine industry – participated in Travel Oregon’s tourism engagement survey. The analysis of results by region is now available. See statewide and regional reports. On Nov. 6, Dr. Greg Jones of Linfield College published an updated weather and climate summary and forecast. This report looks back at October conditions, provides an updated drought watch, and forecasts conditions for November, December and January. Read the report. The submission period is now open to apply to have your wine featured at IPNC in July 2019. Through the selection process, the event organizers hope to introduce guests to the outstanding quality and diversity of Pinot noir now being produced around the world. Get details and submission requirements. OWB is partnering with FedEx to provide free FedEx Ground shipping on Oregon entries to the TEXSOM International Wine Awards. This program is running through Dec. 31. Learn how to take advantage of free shipping. Designed to showcase Northwest wines and wine regions, the SavorNW Wine Awards is open to wineries with fruit grown in Oregon, Washington, Idaho and British Columbia. Learn more and get submission details. The Culinary Institute of America is seeking wine sponsors for a slate of 2019 events. Learn about these sponsorship opportunities. If you are looking for a buyer for your grapes, or are interested in buying grapes, don’t forget to check out the Marketplace on the OWB’s industry website. The Marketplace also includes listings for bulk wine, equipment and job opportunities. Visit the Markeplace.